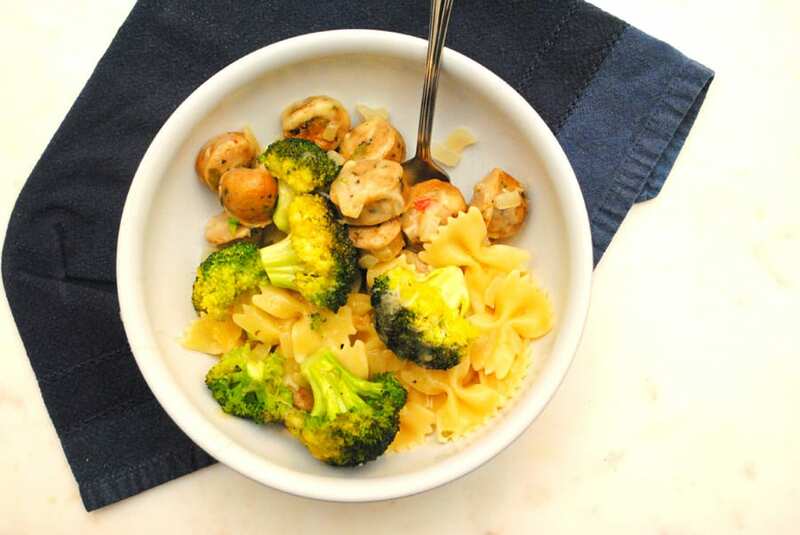 Cool fall nights call for this amazingly decadent Sausage Broccoli Pasta Bake. The bold chicken sausage marries perfectly with the fresh broccoli, soft noodles, and luscious gruyere gravy. Everything sautés perfectly in the pan while the noodles get soft in boiling water. Then it all gets combined into a casserole dish, topped with gooey gruyere cheese and baked until everything is warm, bubbling and the cheese has melted. This Sausage Broccoli Pasta Bake is not hard to come together in fact it could be assembled ahead of time and put in the oven for the final bake at meal time. It’s a great treat to bring to someone who needs a meal as it covers all the bases, protein, carbs, and veg. Plus while it doesn’t look too extraordinary…the flavor on this one, with that rich gravy, really makes the dish pop. It’s lusciously velvety and creamy, while the broccoli is still crisp and the pasta is not too far gone. The gravy sounds heavy but it’s not at all. It lightly flavors everything with the delicious taste of chicken broth and gruyere cheese. While you may want to sub in less expensive Swiss cheese for the Gruyere I urge you not to. Gruyere is so mild and nutty it’s fantastic in this dish. If you want to save some money I would try subbing in Parmesan cheese but lower the salt you put into the gravy. I would start with a 1/4 tsp and add more after tasting as parmesan tends to be very salty all on its own. While the water is boiling heat a large sauté pan over medium heat. Put in the olive oil and then the onion. Let the onion sauté for about five minutes or until it begins to soften. Add in the sausage rounds and cook until they are cooked through, about 8-10 minutes. Toss in the broccoli florets. I usually put the lid on for this last part to help the broccoli along. Cook an additional five minutes. The pan will be crowded. Remove to a large bowl and set aside. Wipe out the inside of the sauté pan. Set it back over the heat. While the butter is melting the water should be boiling for the pasta. Pour the pasta into the boiling water and set your timer according to package directions. After the butter is melted, add in the flour and stir until the flour is combined with the butter and there are no lumps. About one minute. Add in the chicken stock and allow it to come to a simmer. Stir occasionally and let it simmer until it is reduced and thickened. About ten minutes. Then pull it off the heat. Toss in 1/2C of the grated Gruyere cheese. And stir until it is blended well. Stir in the salt and taste. Drain the pasta into a colander and pour it into the bowl with the sausage and broccoli mixture. Pour over the Gruyere gravy and stir. Pour everything into a 9"x13" casserole dish. Bake for 20 minutes or until bubbling and cheese has melted.